In FM 2016, FlutSkin introduced a new Club Overview Panel and a new Club General Overview including the pictures of club cities. With the collaboration of other FM fans it was possible to do the most part of the city pics from clubs all over the world. This is the continuation of the cities MEGAPACK, originally made for FlutSkin but also applies to other custom skins that support city pics. 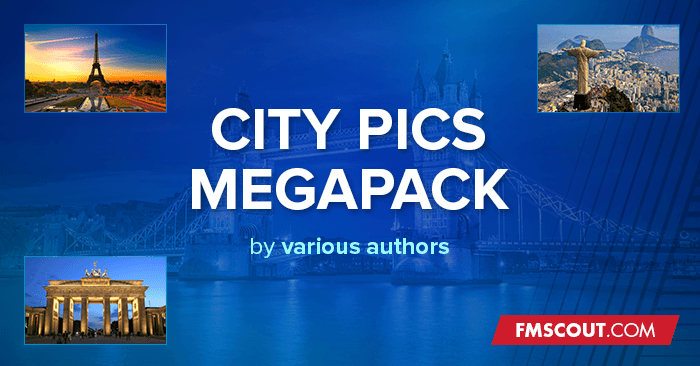 If you already have a folder named Backgrounds (inside the Pictures folder) with your stadium packs, you have to organize the folders in order that the citypics folder will be read by the game BEFORE the backgrounds folder (don’t forget the game reads the folders in alphabetical order). You need to have a custom skin that supports city pics for this to work.